The week prior to this release, the recently reunited classic Guided by Voices lineup had put out their double A-side 7'' The Unsinkable Fats Domino/We Won't Apologize For the Human Race on Matador Records. While the Matador double A-side 7'' was the first new material to see the light of day, both those tracks were later released on Let's Go Eat the Factory (hence its exclusion from the blog). 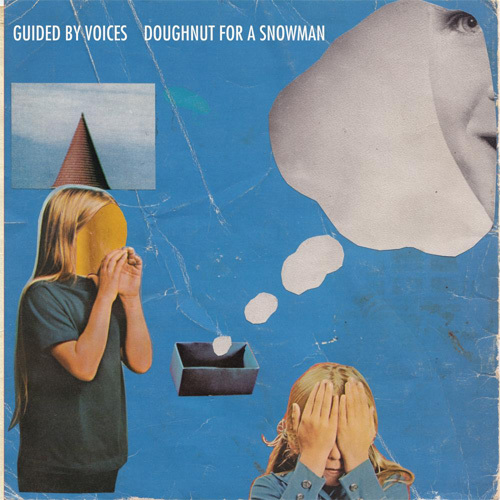 With that, Doughnut For A Snowman 7'' marked the first reunited GBV material to include b-sides, only available on wax; 4 songs to boot. Unfortunately, the 7'' was import only from United Kingdom Fire Records, initially making it somewhat difficult to obtain, until copies began trickling into US retailers. Doughnut for a Snowman is an LP single, and is reviewed as a part of the LP Let's Go Eat the Factory. So High- 4 The recorder, or toy flute (? ), snippet that's cut and pasted onto the beginning of "Doughnut for a Snowman" is the main thread running through this short scrapper of a pop gem. Reminiscent of classic lineup GBV, without the actual lineup. Saccharine sweet melancholy tune, therefore I dig this. Without Necks- 3 Dual vocals delivery over junkyard acoustic guitar strums and out of tune bits popping in out of left field. A "bridge the gap" type of snippet that might fit alright on Alien Lanes? Fish On My Leg- 2 Dirty, lo-fi blues nonsense with Pollard sounding like he's in a reverb chamber. Silly, idiotic song. If you have a kid, an alcoholic father, and you guys all live under one roof, you may hear "Is grandpa drunk and singing dirty blues in the basement again?" after listening. Well in any case, you should check. One, Two, Three, Four- 3 Dumbest song title with a hook just as silly. YET, it is a welcome Tobin Sprout slice of pop jangle tacked onto the end of this over loaded B-side. Can't help but kind of love this '60's coloring book tune. listened to this earlier this morning. I'm embarrassed that I never noticed before that "Fish On my Leg" includes the lyric "clown prince of the menthol trailer." pretty damn good song too, I'd give it a 4.